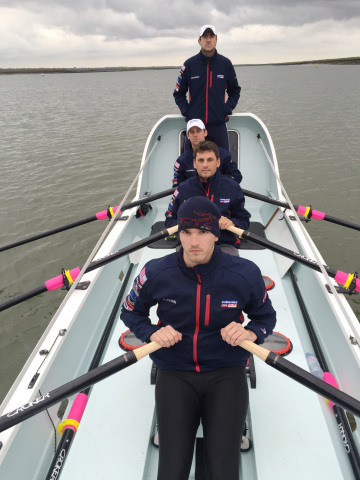 CHARLOTTE, N.C.--(BUSINESS WIRE)--Carlisle Companies Incorporated’s (NYSE:CSL) American Spirit is preparing to row across the Atlantic Ocean in the Atlantic Challenge, where the competitors cross the starting line for this major nautical event on December 15. Rowing across the Atlantic Ocean requires courage and stamina; now imagine doing it during winter! Carlisle Companies is pleased to announce the sponsorship of Carlisle’s American Spirit, a custom vessel designed and built to compete in the 2015 Atlantic Challenge. Known as the Worlds’ Toughest Row, the Atlantic Challenge race pits mankind against the ocean, rowing westward from the Canary Islands, off the coast of Africa, across open and wild seas to the Caribbean. Leaving in December 2015, these competitors are ready to meet the ultimate trial of rowing 3000 nautical miles. Explaining how the Carlisle Companies became involved in this extreme challenge, Chris Koch, President and Chief Operating Officer said, “We are pleased and honored to partner with the crew of Carlisle's American Spirit in their quest to win Talisker’s Atlantic Challenge, the worlds’ toughest row. Carlisle’s relationship with Team Concepts and Jason Caldwell, the American Spirit’s Captain, began a few years ago on the campus of Indiana University. Jason has worked with many of our top and emerging leaders through our flagship leadership development program. All of us at Carlisle are excited to watch the American Spirit and her crew as they attempt to break the record for the Atlantic crossing. We will be following their progress at http://carlisle-crew-usa.com/blog/ and many social media sites, including Facebook, during their month long quest. Winning the Atlantic Challenge requires more than just extreme athleticism. It demands goal setting, careful planning, and teamwork with high performance execution. To meet those requirements, Carlisle Companies has commissioned Carlisle’s American Spirit, a new boat currently under custom construction for this race. At just 28 feet (8.64 meters) long and less than 6 feet (1.74 meters) wide, the compact craft will hold the latest technology, safety equipment and rations to support this American team in the Atlantic Challenge fours event. Carlisle’s American Spirit is captained by Jason Caldwell, with crew members Thomas Magarov, Nicholas Khan, and Greg Wood. All competition-level rowers, these men are experienced in open sea events and will share the cramped space aboard, never leaving the vessel for the duration of the race. With two rowing positions, these athletes will be pulling Carlisle’s American Spirit 24 hours a day through ocean waves, often 12-16 feet or higher, in an attempt to achieve a new Atlantic world record crossing time under nature’s relentless and intense conditions. “Our goal is to represent the United States as a country to be recognized and respected in the world of trans-ocean racing”, stated Jason Caldwell, Captain of Carlisle's American Spirit. “This can only be accomplished with good strategy, hard work, and support from those who have come before you. That strategy and hard work is personified by my teammates and our coach, who have worked and trained obsessively this last year to prepare for the world’s toughest race. There isn’t another group of men I’d more trust with my life and the reputation of our country than these. With regards to leveraging those who have come before you, there is no better champion than our title sponsor, Carlisle Companies Inc. Armed with a history of winning with high-performance teams, Carlisle has been an integral part of our preparation to this point, and in doing so has redefined the standard of what it means to sponsor and support an open-ocean racing team. Carlisle has given our team every opportunity to achieve greatness and make history, transforming our crew to an international team of 11,005. And it is because of this, we couldn’t be more grateful." As a part of a globally diversified organization, the employees of Carlisle’s business units understand teamwork and the need for high performance execution. Several of Carlisle’s companies are providing equipment and support for Carlisle’s American Spirit and her crew. Carlisle’s American Spirit sets off from San Sebastian de La Gomera in the Canary Islands on December 15, 2015 and expects to arrive at Nelson’s Dockyard English Harbour, Antigua in approximately 30 days, having secured several new performance records. The public can follow the crossing and send messages of support via the website at http://carlisle-crew-usa.com/blog/ and social media. The expertise within Carlisle Companies supports the extreme needs Carlisle’s American Spirit will have preparing for and experiencing the 2015 Atlantic Challenge. Carlisle is ready to provide high performance solutions to ensure the success of this All-American team during the race, and also to provide high performance solutions for Carlisle’s customers worldwide in their own races to meet the challenges of their businesses every day.